The communicative approach is a learner centred approach. This approach gives the learner not only grammatical competence but also a social skill as to what to say. How to say, when to say and where, in order to satisfy his daily needs as larger aim. In this approach, apart from fluency, accuracy and appropriateness are equally important. Thus an effective use of language needs to produce grammatically well formed. Communicative approach stresses the purpose of writing and audience of it. So teachers using this approach, have extended the readership. Teachers specify readers outride the classroom. The goal of communicative approach is to make learners communicatively competency. In this approach the teacher is seen as a facilitators of his students, learning. Communicative approach is based on the idea that the aim of learning second language is to gain communicative competency. In this approach learner have to knowledge of the rules of use of language to generate language appropriately for certain situations. He should have also the knowledge of the use of techniques to communicate effectively. This approach draws attention toward on the use of language in every day life. Communicative Language teaching emerged in the 1970s and 1980s. The "term communicate" meant to express or convey the ideas verbally or non-verbally. This approach emphasizes the communicative capability of the learners. 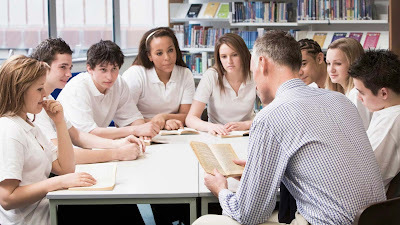 In English language teaching, the teacher tries to develop communicative ability in students or learners. Communicative capability is also known as communicative competence includes the following competences. There are eight aspects of communicative competences. They are grouped into two parts. 1. Instrumental function of language is using language to get things. 2. Regulatory function of language is using language to control the behaviour of others. 3. Interaction function of language is using language to create interaction with others. 4. Personal function of language is using language to express personal feeling and thoughts. 5. Imaginative function of language is using language to create the world of imagination. 6. Representational function of language is using language to communicate. 7. Heuristic function of language is using language to learn and discover. 1. Communicative approach emphasis on communication of language because it plays important part in development of sociality of human. creature. 2. The message or thoughts expressed in communication are always in form of function so this approach is very useful. 3. If this approach is used in classroom activities then it will be very useful for leaner because in many classes language is taught as to pass examination only so this approach enables students to develop communicative ability which is very important activity of life. 4. Through communicative approach, the leaner learn target language as he learns mother tongue. It means that the atmosphere of English language is created so that student could learn English directly. environment of target language learning is created. 6. All the teaching learning materials are prepared according to child attitude and interest or individual difference so that child could learn language easily and effectively. This approach is learner centred. 7. In communicative approach every where, in schools, classroom, on stages, and seminars, we can say that the learner are taught as a native person learn his language. 8. The students should be provided real life situations. Creativeness of role play, simulation, project~ should be produced in students so that they could connect these all with real life situation. 9. In communicative approach, the emphasis on active mode of learning is given. Thus it makes students active in their activities including pair work and group work. distinctively taught in this approach. 11. In this approach the visual aids are permitted. These aids help to provoke practical communication. They help to motivate and focus pupils' attention. 12. The language is never static: it is dynamic. This approach helps to learner to use language naturally and according to accepted form and usage. 13. The active use of lexical items help learner to develop vocabulary. There should not be passive use of lexical items. They need active command of using words in meaningful message, so in this approach the lexical items are taught in context. 1. Main function of communicative approach is to develop communication competences, so they are provided with optimum opportunities to use the language. society. They are motivated to form the bridge of communication and to make use of real life language, in other words language in use. 4. In this approach the modem methods are used make teaching very e£. (ective and interested. 5. In this approach every leaner are active during teaching because there are interaction among learner and teacher. They communicate verbally and non-verbally to each other, so every student is active. 6. This approach provides sufficient opportunity to students for practice of communication with other students or people. 0 Response to "What is Communicative Approach"